Dana DeSimone at Eagles Hall in Alameda, CA. Photo by John Noltner. Dana DeSimone’s Friday night dances are some of the most popular events in the Northern California zydeco and Cajun music scene. 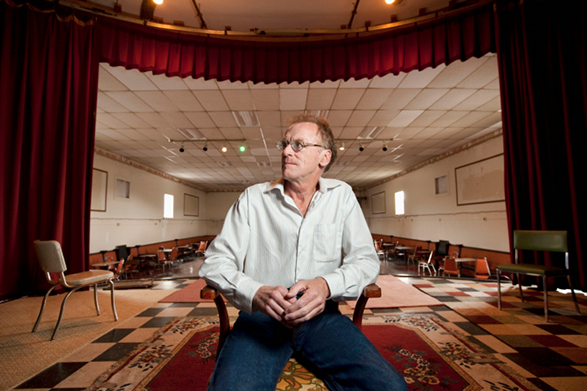 DeSimone frequently packs Eagles Hall, an old fraternal lodge in Alameda that hosts dances every week of the year. Not only does he organize the gatherings; he also teaches zydeco steps to the newcomers who attend. Eagles Hall is one of the most enduring institutions in the Bay Area’s Louisiana music scene: Over more than 16 years, Eagles Hall has booked just about every band in the region as well as many visiting musicians from Louisiana. Born in San Francisco to an Irish-Italian working-class family, DeSimone studied a variety of folk-dance styles: Greek, Balkan, clogging, salsa, merengue, country-western, and even belly dancing. He traveled to Southern Appalachia several times to study clogging, and served as artistic director for a local clogging group called the Cornmashers. He performed solo at festivals too. In this outtake, he explains how Louisiana music caught his attention—and bailed him out of a rough time.